Explore these options to help save on prescription drug costs. Click on your state in the map below to learn more about drug assistance programs in your area. On average, people age 65 and older spend over three percent of their income on prescription drugs. For the 43 percent of single Social Security recipients who rely on their Social Security check for 90 percent or more of their income, lofty drug prices can be detrimental to their economic well-being. Medicare Part D helps cover some prescription drugs for those enrolled in Medicare, but recipients must pay a monthly premium for Part D coverage (in addition to their Part B or Part C premium). Some Medicare plans that offer drug coverage can help you save money on your prescriptions. 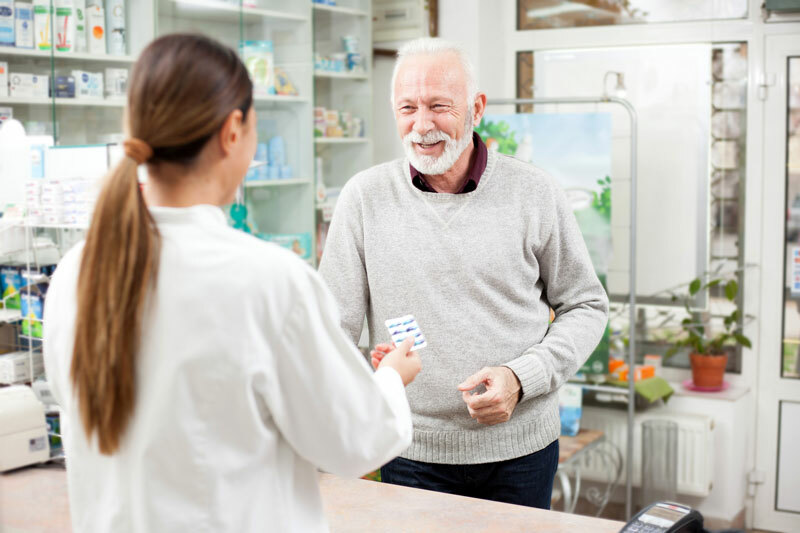 Certain preferred pharmacies may offer savings to plan beneficiaries, and some plans may cover your drugs with little or no copay or deductible. Or call 1-800-557-6059 TTY: 711 to speak with a licensed insurance agent to learn more about Medicare prescription drug coverage that’s available where you live. To help those with limited incomes pay for the Part D premium and other costs, the Social Security Administration offers the Extra Help program. This program helps pay for some Medicare Part D costs, such as monthly premiums, annual deductibles and copayments. To qualify for Extra Help, your annual income must be below $18,090 if you’re single or below $24,360 if you’re married. Additionally, your combined savings, investments and real estate must be below $13,820 if you’re single or below $27,600 if you’re married. Fortunately, many states that do not offer Extra Help offer other programs to help residents afford their prescription medications. Find your state below to see the prescription assistance programs it offers. This prescription assistance program provides prescription drug coupons to help Alabama residents afford their prescription medications. There are no income or age requirements — simply print the coupon by clicking the link above. The Alabama SenioRx program provides free or low cost prescription drugs to qualifying Alabama residents. The state of Alabama offers several resources for people who are affected and infected by HIV and who have a low income, are uninsured, or are underinsured. The Ryan White fund helps pay for services that cannot be reimbursed or paid for by an individuals’ other private and public health care programs. ALL Kids is the Alabama state extension of the national Children's Health Insurance Program (CHIP), which helps children in families with too high of incomes to qualify for Medicaid but who have a hard time affording health insurance coverage. Some of the benefits of CHIP include coverage for immunizations and prescriptions. To qualify, a child must typically be age 18 or younger, live in the state of Alabama, not be covered by or eligible for Medicaid and not be a resident in an institution. This statewide prescription assistance program can help Alaska residents save up to 75 percent on prescription drugs. There are no income or age requirements — simply print the coupon online and use at over 68,000 participating pharmacies nationwide. SeniorBenefits offers benefits of $76 to $250 a month depending on your income. Status as an active client of one of the State-funded HIV Care Consortium lead agencies. Currently, these agencies include the Alaskan AIDS Assistance Association (Four A's) and the Interior AIDS Association (IAA). Denali KidCare is the Alaska state extention of the national Children's Health Insurance Program (CHIP), which helps children in families with too high of incomes to qualify for Medicaid but who have a hard time affording health insurance coverage. Some of the benefits of CHIP include coverage for immunizations and prescriptions. To qualify, a child must typically be age 18 or younger, live in the state of Alaska and meet income requirements. This prescription assistance program provides discounts on brand-name and generic medications for all Arizona residents. There are no income or age requirements, and you have the freedom to choose from over 68,000 participating pharmacies nationwide. The AIDS Drug Assistance Program (ADAP) helps individuals living with HIV disease receive the medications used to treat HIV and prevent related infections. The program is for low-income individuals with HIV who are uninsured or underinsured. The Children's Health Insurance Program (CHIP) helps children in families with too high of incomes to qualify for Medicaid but who have a hard time affording health insurance coverage. Some of the benefits of CHIP include coverage for immunizations and prescriptions. To qualify, a child must typically be age 18 or younger and live in the state of Arizona. This is a free program that provides prescription assistance to all Arkansas residents. Although it is designed to help uninsured Arkansas residents afford their prescription medications, it can also be used to supplement Medicare Part D coverage by providing discounts on non-covered drugs. The Arkansas ADAP helps people living with HIV and AIDS have access to the medication they need if they are uninsured or under-insured. There are additional medical criteria you must meet in order to qualify for the program. ARKids First! is a the Arkansas extension of the the national Children's Health Insurance Program (CHIP), which helps children in families with too high of incomes to qualify for Medicaid but who have a hard time affording health insurance coverage. Some of the benefits of CHIP include coverage for immunizations and prescriptions. To qualify, a child must typically be age 18 or younger and live in the state of Arkansas. This program provides pharmacy coupon cards that can help CA residents save up to 75 percent on prescription medications. There are no income or age requirements — just follow the link above and print your coupon card today. The California ADAP helps ensure that people who live with HIV and AIDS in California have access to medication. You must be uninsured or under-insured to qualify for the program. If you are enrolled in the ADAP, you are also eligible for the Office of Aids Health Insurance Premium Payment Program (OA-HIPP) or the Medicare Part D payment program. Medi-Cal provides essential health benefits to qualifying low-income children, pregnant women, families and individuals. These benefits include prescription drug coverage as well as preventive and wellness services, among other benefits. This prescription assistance program provides discounts on brand-name and generic medications for all Colorado residents. There are no income or age requirements, and you have the freedom to choose from over 68,000 participating pharmacies nationwide. ADAP is a free program for low-income individuals who need AIDS-specific medications. Use the link above to fill out an application. Your household income must be at or below four times the Federal Poverty Level. If your income is between four and five times the FPL, you're eligible for assistance with prescription medications only. Child Health Plan Plus (CHP+) is the Colorado state extension of the national Children's Health Insurance Program (CHIP), which helps children in families with too high of incomes to qualify for Medicaid but who have a hard time affording health insurance coverage. Some of the benefits of CHP+ include coverage for immunizations and prescriptions. To qualify, a child must typically be age 18 or younger, live in the state of Colorado, not be eligible for Health First Colorado and meet income requirements. This statewide prescription assistance program helps CT residents save on prescription drugs through printable coupons. Choose from over 68,000 participating pharmacies nationwide. To get your free coupon, follow the link above. ADAP helps individuals with HIV or AIDS afford treatment medication. Follow the link above to find more information on the eligibility requirements. HUSKY Health is the Connecticut state extension of the national Children's Health Insurance Program (CHIP), which helps children in families with too high of incomes to qualify for Medicaid but who have a hard time affording health insurance coverage. Some of the benefits of Husky Health include coverage for immunizations and prescriptions. To qualify, a child must typically be age 18 or younger, live in the state of Connecticut and meet income requirements. This program gives members up to $3,000 a year toward prescription drugs deemed medically necessary. To use this program, members must pay a 25 percent copayment to the pharmacy where the prescription is filled. There is a minimum copayment of $5. The pharmacy then sends a claim to DPAP, and the program pays directly to the pharmacy. The ADAP functions as the payer of last resort for those who need financial assistance covering the costs of HIV/AIDS medication. The Delaware AIDS Prescription Drug Program formulary lists what medications are covered. The Delaware Healthy Children Program is the state extension of the national Children's Health Insurance Program (CHIP), which helps children in families with too high of incomes to qualify for Medicaid but who have a hard time affording health insurance coverage. Some of the benefits of the Delaware Healthy Children Program include coverage for immunizations and prescriptions. To qualify, a child must typically be age 18 or younger, live in the state of Delaware and meet income requirements. This program provides free discount prescription drug coupons that you can print online. Follow the link above to print your discount card now. This statewide program is available to all Florida residents and can save them up to 75 percent on their prescription medications. Follow the link above to get your free pharmacy discount card, which can be used at over 60,000 participating pharmacies, including Walgreens, CVS, Walmart and Rite Aid. If you don’t qualify for ADAP, you may still be able to get prescription drug assistance through needmymeds.org or pparx.org. Florida Kid Care is the state extension of the national Children's Health Insurance Program (CHIP), which helps children in families with too high of incomes to qualify for Medicaid but who have a hard time affording health insurance coverage. Some of the benefits of Florida Kid Care include coverage for immunizations and prescriptions. To qualify, a child must typically be age 18 or younger, live in the state of Florida and meet income requirements. This free assistance program is available to all residents of the state of Georgia. The Georgia Drug Card can help residents save up to 75 percent on their prescription medications and can be used at thousands of pharmacies nationwide. The Georgia Prescription Assistance Program helps GA residents save on prescriptions at over 60,000 participating pharmacies. Follow the link above to sign up for your free pharmacy discount card. This state program provides HIV and AIDS medications to Georgia residents who have limited financial resources and little-to-no coverage from other insurance options. PeachCare for Kids is the state extension of the national Children's Health Insurance Program (CHIP), which helps children in families with too high of incomes to qualify for Medicaid but who have a hard time affording health insurance coverage. Some of the benefits of PeachCare for Kids include coverage for immunizations and prescriptions. To qualify, a child must typically be age 18 or younger, not be eligible for Medicaid and live in the state of Georgia and meet income requirements. This statewide program provides assistance to Hawaii residents who need help paying for their prescription medications. Follow the link above to print your free discount prescription drug card coupon, and start saving at over 68,000 pharmacies nationwide. ADAP provides HIV positive individuals who have limited income with medication to treat HIV. There is no cost to the individual with ADAP. The Children's Health Insurance Program (CHIP) helps children in families with too high of incomes to qualify for Medicaid but who have a hard time affording health insurance coverage. Some of the benefits of CHIP include coverage for immunizations and prescriptions. To qualify, a child must typically be age 18 or younger, live in the state of Hawaii and meet income requirements. All Idaho residents have access to this statewide prescription assistance program. Print your free discount prescription drug card coupon by following the link above. With your coupon you can receive up to 75 percent in savings that can be used at more than 68,000 pharmacies nationwide. This program helps people with HIV pay for their prescription copays and out-of-pocket expenses associated with Medicare Part D’s donut hole. The Children's Health Insurance Program (CHIP) helps children in families with too high of incomes to qualify for Medicaid but who have a hard time affording health insurance coverage. Some of the benefits of CHIP include coverage for immunizations and prescriptions. To qualify, a child must typically be age 18 or younger, not have private health insurance and live in the state of Idaho and meet income requirements. All Illinois residents have access to this statewide prescription assistance program. Print your free discount prescription drug card coupon by following the link above. Your coupon can be used at more than 68,000 pharmacies nationwide, including CVS, Walgreens, Kroger, Walmart and Albertsons. This program helps uninsured or underinsured Illinois residents pay for their prescription medications using free, pre-activated prescription drug coupon cards. There are no eligibility requirements or restrictions. Clients approved for Illinois ADAP services will need to re-apply for the program every six months. Review the eligibility and application requirements online to make sure you have everything you need to apply. The Illinois ADAP can help you access HIV/AIDS medications even if you are underinsured, uninsured, or have limited financial resources. All Kids is the state extension of the Children's Health Insurance Program (CHIP), which helps children in families with too high of incomes to qualify for Medicaid but who have a hard time affording health insurance coverage. Some of the benefits of CHIP include coverage for immunizations and prescriptions. To qualify, a child must typically be age 18 or younger, live in the state of Illinois and meet income requirements. HoosierRx is a program that provides up to $70 per month toward prescription drugs. The benefit is paid directly to the participating Medicare plan. Residents of Indiana can take advantage of the Indiana Drug Card to save up to 75 percent off at more than 68,000 pharmacies nationwide including CVS, Walmart and more. The card is pre-activated, can be used immediately and can even be shared among friends and family members. This program provides comprehensive health insurance to those suffering from HIV and includes access to therapeutic medications and medical services along with all FDA-approved highly active antiretroviral drugs. There are four different plans offered and each is available at no cost to the individual. Hoosier Healthwise manages the state extension of the Children's Health Insurance Program (CHIP), which helps pregnant women and children in families with too high of incomes to qualify for Medicaid but who have a hard time affording health insurance coverage. Some of the benefits of CHIP include coverage for immunizations and prescriptions. To qualify, a child must typically be age 18 or younger, live in the state of Indiana and meet income requirements. Iowa Drug Card is a program in which Iowa residents can print free discount prescription coupons up to 75 percent in savings at more than 68,000 pharmacies. To start saving, follow the link above. There are several programs that provide support to Iowa residents living with HIV/AIDS. The ADAP helps provide people with free medication to treat HIV and AIDS as well as related infections. ADAP is a payer of last resort but can also help support residents who have no insurance coverage or who are under insured. The hawk-i program is the state extension of the Children's Health Insurance Program (CHIP), which helps children in families with too high of incomes to qualify for Medicaid but who have a hard time affording health insurance coverage. Some of the benefits of hawk-i include coverage for immunizations and prescriptions. To qualify, a child must typically be age 18 or younger, live in the state of Iowa and meet income requirements. Kansas residents have access to a statewide prescription assistance program that can save them up to 75 percent on their prescription medications. To start saving, follow the link above and print, text, email or save your prescription drug card coupon today. The Kansas ADAP helps ensure people living with HIV/AIDS have access to the medication they need, even if they are underinsured or uninsured entirely. Kancare is the state extension of the Children's Health Insurance Program (CHIP), which helps children in families with too high of incomes to qualify for Medicaid but who have a hard time affording health insurance coverage. Some of the benefits of Kancare include coverage for immunizations and prescriptions. To qualify, a child must typically be age 18 or younger, live in the state of Kansas and meet income requirements. All Kentucky residents have access to this statewide prescription assistance program, regardless of income. To take part in this program, simply visit the Kentucky Rx Card website and print your free discount prescription drug card coupon. This coupon can be used at more than 68,000 pharmacies nationwide, including Walgreens, Walmart, CVS and Kroger. This program helps qualifying Kentucky residents locate free or reduced-cost prescription drugs. Eligibility is largely based on income — individuals with annual incomes from 200 percent to 400 percent of the federal poverty level may qualify. Senior citizens in the Medicare doughnut hole may also be eligible. Kentucky Children's Health Insurance Program (KCHIP) is the state extension of the federal Children's Health Insurance Program (CHIP), which helps children in families with too high of incomes to qualify for Medicaid but who have a hard time affording health insurance coverage. Some of the benefits of KCHIP include coverage for immunizations and prescriptions. To qualify, a child must typically be age 18 or younger, live in the state of Kentucky and meet income requirements. Louisiana Children’s Health Insurance Program (LaCHIP) is the state extension of the federal Children's Health Insurance Program (CHIP), which helps children in families with too high of incomes to qualify for Medicaid but who have a hard time affording health insurance coverage. Some of the benefits of LaCHIP include coverage for immunizations and prescriptions. To qualify, a child must typically be age 18 or younger, live in the state of Louisiana and meet income requirements. This program pays 80 percent minus $2 of the cost of generic prescriptions and some brand-name prescriptions. Any other prescriptions deemed medically necessary may be covered in different amounts. There is a Catastrophic Spending Limit. After you pay $1,000 in eligible prescriptions, the program will then pay 80 percent of all eligible prescriptions. If you have other prescription drug coverage, that program must pay first. The Maine ADAP functions as the payer of last resort for those who need financial assistance covering the costs of HIV/AIDS medication. MaineCare is the state extension of the federal Children's Health Insurance Program (CHIP), which helps children in families with too high of incomes to qualify for Medicaid but who have a hard time affording health insurance coverage. Some of the benefits of MaineCare include coverage for immunizations and prescriptions. To qualify, a child must typically be age 18 or younger, live in the state of Maine and meet income requirements. Maryland SPDAD is a program that pays up to $40 a month for Medicare Rx prescription drug plan premiums. The program is for patients who are on chronic maintenance dialysis or have received a renal transplant and meet the eligibility requirements. If you are enrolled in Medicare, the program pays AFTER Medicare pays. This state program provides HIV and AIDS medications to Maryland residents who have limited financial resources and little-to-no coverage from other insurance options. Maryland Children’s Health Program (MCHP) is the state extension of the federal Children's Health Insurance Program (CHIP), which helps children in families with too high of incomes to qualify for Medicaid but who have a hard time affording health insurance coverage. Some of the benefits of MCHP include coverage for immunizations and prescriptions. To qualify, a child must typically be age 18 or younger, live in the state of Maryland and meet income requirements. This is a state-sponsored program designed to help seniors and people with disabilities get lower rates for their prescription drugs. With Massachusetts Prescription Advantage, your copays will depend on your income. The program comes with an annual out-of-pocket limit, meaning your copayments will be covered until the end of the year once the limit is reached. This program doesn’t cover drugs that are excluded from Medicare coverage, except for benzodiazepines. The Massachusetts ADAP functions as the payer of last resort for those who need financial assistance covering the costs of HIV/AIDS medication. MassHealth administers the state extension of the federal Children's Health Insurance Program (CHIP), which helps children in families with too high of incomes to qualify for Medicaid but who have a hard time affording health insurance coverage. Some of the benefits of MassHealth include coverage for immunizations and prescriptions. To qualify, a child must typically be age 18 or younger, live in the state of Massachusetts and meet income requirements. This free program is available to all Michigan residents who need assistance paying for prescription medications. The discount is good on any prescription drug that the pharmacy stocks and your doctor prescribes. Simply show your MiRx card to a participating pharmacy and the pharmacist will charge the MiRx discounted price for the medication. The ADAP functions as the payer of last resort for those who need financial assistance covering the costs of HIV/AIDS medication. In some cases, you need to have applied for public assistance with the Michigan Department of Health and Human Services within the past 90 days and have a pending, denial, or spend-down status. Your gross income must not exceed 500 percent of the federal poverty level. MIChild is the state extension of the federal Children's Health Insurance Program (CHIP), which helps children in families with too high of incomes to qualify for Medicaid but who have a hard time affording health insurance coverage. Some of the benefits of MIChild include coverage for immunizations and prescriptions. To qualify, a child must typically be age 18 or younger, live in the state of Michigan and meet income requirements. This program provides Minnesota residents access to a free statewide Prescription Assistance Program (PAP) for uninsured and underinsured residents. This program provides up to 75 percent in savings on name brand and generic medications with no eligibility requirements for the program. The Minnesota ADAP helps ensure that people who live with HIV and AIDS in Minnesota have access to medication. You must be uninsured or under-insured to qualify for the program. MinnesotaCare manages the state extension of the federal Children's Health Insurance Program (CHIP), which helps children in families with too high of incomes to qualify for Medicaid but who have a hard time affording health insurance coverage. Some of the benefits of MinnesotaCare include coverage for immunizations and prescriptions. To qualify, a child must typically be age 18 or younger, live in the state of Minnesota and meet income requirements. Mississippi residents have access to this free statewide prescription assistance program regardless of income, age or other factors. Simply follow the link and print your free coupon now to start saving on your prescription drugs. The Mississippi ADAP helps people living with HIV and AIDS have access to the medication they need if they are uninsured or under-insured. Obtain the services available through Medicaid, Medicare, SCHIP, Federal Exchange Marketplace plans, or other payor if covered. The federal Children's Health Insurance Program (CHIP) helps children in families with too high of incomes to qualify for Medicaid but who have a hard time affording health insurance coverage. Some of the benefits of CHIP include coverage for immunizations and prescriptions. To qualify, a child must typically be age 18 or younger, live in the state of Mississippi and meet income requirements. The Missouri Rx Plan works in addition to Medicare Part D plans to pay half of the out-of-pocket costs. This includes deductibles, copays and the coverage gap. It does not pay for premiums. This state program provides HIV and AIDS medications to Missouri residents who have limited financial resources and little-to-no coverage from other insurance options. MO HealthNet for Kids (MHK) is the state extension of the federal Children's Health Insurance Program (CHIP), which helps children in families with too high of incomes to qualify for Medicaid but who have a hard time affording health insurance coverage. Some of the benefits of MHK include coverage for immunizations and prescriptions. To qualify, a child must typically be age 18 or younger, live in the state of Missouri and meet income requirements. Big Sky Rx (BSRx) helps Montana Medicare recipients pay for Medicare approved prescription drug insurance premiums. The Montana ADAP functions as the payer of last resort for those who need financial assistance covering the costs of HIV/AIDS medication. Healthy Montana Kids (HMK) is the state extension of the federal Children's Health Insurance Program (CHIP), which helps children in families with too high of incomes to qualify for Medicaid but who have a hard time affording health insurance coverage. Some of the benefits of HMK include coverage for immunizations and prescriptions. To qualify, a child must typically be age 18 or younger, live in the state of Montana and meet income requirements. This program is free to all Nebraska residents, even those with insurance. Print a free pre-activated card, locate participating pharmacies, and search drug pricing by clicking the link above. The federal Children's Health Insurance Program (CHIP) helps children in families with too high of incomes to qualify for Medicaid but who have a hard time affording health insurance coverage. Some of the benefits of CHIP include coverage for immunizations and prescriptions. To qualify, a child must typically be age 18 or younger, live in the state of Nebraska and meet income requirements. Disability Rx helps pay for Medicare Part D premiums while in the donut hole. This state program provides HIV and AIDS medications to Nevada residents who have limited financial resources and little-to-no coverage from other insurance options. A completed RWPB Eligibility Application form and Eligibility and Enrollment checklist form. Nevada Check Up is the state extension of the federal Children's Health Insurance Program (CHIP) helps children in families with too high of incomes to qualify for Medicaid but who have a hard time affording health insurance coverage. Some of the benefits of Nevada Check Up include coverage for immunizations and prescriptions. To qualify, a child must typically be age 18 or younger, live in the state of Nevada and meet income requirements. New Hampshire residents can print free discount prescription coupons up to 75 percent in savings at more than 68,000 pharmacies. Simply follow the link and print your free coupon now to start saving on your prescription drugs. This program helps low income individuals access prescription medications, whether uninsured or underinsured. This program only covers long-term medications. Not be eligible for any other type of prescription coverage for that particular medication- including: Medicaid, VA, private insurance, etc. The New Hampshire ADAP helps people living with HIV and AIDS have access to the medication they need if they are uninsured or under-insured. The federal Children's Health Insurance Program (CHIP) helps children in families with too high of incomes to qualify for Medicaid but who have a hard time affording health insurance coverage. Some of the benefits of CHIP include coverage for immunizations and prescriptions. To qualify, a child must typically be age 18 or younger, live in the state of New Hampshire and meet income requirements. This state-funded prescription program helps seniors and other qualifying individuals pay for prescription drugs. Have an annual income of less than $26,655 if you are single or less than $32,680 if you’re married (in 2017). NJ FamilyCare administers the state extension of the federal Children's Health Insurance Program (CHIP), which helps children in families with too high of incomes to qualify for Medicaid but who have a hard time affording health insurance coverage. Some of the benefits of NJ FamilyCare include coverage for immunizations and prescriptions. To qualify, a child must typically be age 18 or younger, live in the state of New Jersey and meet income requirements. This program provides New Mexico residents access to a free statewide Prescription Assistance Program (PAP) for uninsured and underinsured residents. All residents are eligible for this program as it provides up to 75 percent in savings on some medications. Simply follow the link and print your free coupon now to start saving on your prescription drugs. This program helps New Mexico residents of low to middle income afford brand name prescription medicines. This state program provides HIV and AIDS medications to New Mexico residents who have limited financial resources and little-to-no coverage from other insurance options. The federal Children's Health Insurance Program (CHIP) helps children in families with too high of incomes to qualify for Medicaid but who have a hard time affording health insurance coverage. Some of the benefits of CHIP include coverage for immunizations and prescriptions. To qualify, a child must typically be age 18 or younger, live in the state of New Mexico and meet income requirements. With the New York Rx Card program, New York residents can print free discount prescription coupons up to 75 percent in savings at more than 68,000 pharmacies. Simply follow the link and print your free coupon now to start saving on your prescription drugs. Child Health Plus is the state extension of the federal Children's Health Insurance Program (CHIP), which helps children in families with too high of incomes to qualify for Medicaid but who have a hard time affording health insurance coverage. Some of the benefits of Child Health Plus include coverage for immunizations and prescriptions. To qualify, a child must typically be age 18 or younger, live in the state of New York and meet income requirements. This program provides North Carolina residents access to a free statewide Prescription Assistance Program (PAP) for uninsured and underinsured residents. All residents are eligible for this program — simply follow the link and print your free coupon now to start saving on your prescription drugs. This program makes prescription drugs available to uninsured, low-income individuals through participating pharmaceutical manufacturers. This program is for HIV patients who need help paying for prescriptions (even those enrolled in Medicare Part D). With this plan, you pay your Part D premiums and SPAP pays the associated out-of-pocket costs for medications, including copays and the donut hole. NC Health Choice for Children is the state extension of the federal Children's Health Insurance Program (CHIP), which helps children in families with too high of incomes to qualify for Medicaid but who have a hard time affording health insurance coverage. Some of the benefits of NC Health Choice for Children include coverage for immunizations and prescriptions. To qualify, a child must typically be age 18 or younger, live in the state of North Carolina and meet income requirements. North Dakota residents have access to a Prescription Assistance Program in which residents can print free discount prescription coupons up to 75 percent in savings at more than 68,000 pharmacies. Simply follow the link and print your free coupon now to start saving on your prescription drugs. North Dakota Insurance Department has a program called Prescription Connection which provides access to people of all ages with free or discounted prescription drugs. The North Dakota ADAP helps ensure that people who live with HIV and AIDS in North Dakota have access to medication. You must be uninsured or under-insured to qualify for the program. Healthy Steps is the North Dakota extension of the federal Children's Health Insurance Program (CHIP), which helps children in families with too high of incomes to qualify for Medicaid but who have a hard time affording health insurance coverage. Some of the benefits of Healthy Steps include coverage for immunizations and prescriptions. To qualify, a child must typically be age 18 or younger, live in the state of North Dakota and meet income requirements. Ohio’s Best Rx is available to all Ohio residents without restrictions for savings on prescription medications. The program is accepted at 60,000+ pharmacies, this website can be used to register a card, find a pharmacy closest to you and compare the prices. This state program provides HIV and AIDS medications to Ohio residents who have limited financial resources and little-to-no coverage from other insurance options. Ohio Healthy Start is the state extension of the federal Children's Health Insurance Program (CHIP), which helps children in families with too high of incomes to qualify for Medicaid but who have a hard time affording health insurance coverage. Some of the benefits of Ohio Healthy Start include coverage for immunizations and prescriptions. To qualify, a child must typically be age 18 or younger, live in the state of Ohio and meet income requirements. Oklahoma Rx provides financial assistance for prescription medications for uninsured, underinsured, or low income families. Eligibility includes: Oklahoma residents, regardless of age, who are uninsured, underinsured or at or below the federal poverty line. Medicare Part D and Medicaid beneficiaries with unique circumstances may also qualify. This program provides Oklahoma residents access to a free statewide Prescription Assistance Program for uninsured and underinsured residents. All residents are eligible for this program. Just follow the link and print your free coupon now to start saving on your prescription drugs. Have a monthly family household gross income of at or below 200 percent of the federal poverty guidelines. The federal Children's Health Insurance Program (CHIP) helps children in families with too high of incomes to qualify for Medicaid but who have a hard time affording health insurance coverage. Some of the benefits of Oklahoma CHIP include coverage for immunizations and prescriptions. To qualify, a child must typically be age 18 or younger, live in the state of Oklahoma and meet income requirements. OPDP is a free prescription discount card program that does not have any age or income limits. Save 80 percent on generic drugs approved by the FDA and prescribed by a licensed clinician. This program is targeted towards underinsured Oregon residents. This state program provides HIV and AIDS medications to Oregon residents who have limited financial resources and little-to-no coverage from other insurance options. The federal Children's Health Insurance Program (CHIP) helps children in families with too high of incomes to qualify for Medicaid but who have a hard time affording health insurance coverage. Some of the benefits of Oregon CHIP include coverage for immunizations and prescriptions. To qualify, a child must typically be age 18 or younger, live in the state of Oregon and meet income requirements. This program is comprised of two parts: the HIV/AIDS benefit and the Mental Health benefit. Each part helps pay prescription drug costs and some lab services for low income individuals after other third party benefits have paid. Additionally, to qualify for HIV/AIDS benefits, you must have a medical need for at least one HIV/AIDS antiretroviral medication. To qualify for Mental Health benefits, you must be diagnosed with schizophrenia. PACE offers low-cost prescription medications to qualified residents who are age 65 years or older. If you have a higher income than those listed above, you may qualify for Pennsylvania PACE Needs Enhancement Tier (PACENET). This CRDP helps pay for costs related to medications, home dialysis supplies and more. The federal Children's Health Insurance Program (CHIP) helps children in families with too high of incomes to qualify for Medicaid but who have a hard time affording health insurance coverage. Some of the benefits of Pennsylvania CHIP include coverage for immunizations and prescriptions. To qualify, a child must typically be age 18 or younger, live in the state of Pennsylvania and meet income requirements. The level of assistance depends on your income, your marital status and whether you are over 65 or 55-64 with a disability. Check out how much support you could qualify for in the chart below. RIte Care is the state extension of the federal Children's Health Insurance Program (CHIP), which helps children in families with too high of incomes to qualify for Medicaid but who have a hard time affording health insurance coverage. Some of the benefits of RIte Care include coverage for immunizations and prescriptions. To qualify, a child must typically be age 18 or younger, live in the state of Rhode Island and meet income requirements. This program provides South Carolina residents access to a free statewide Prescription Assistance Program (PAP) for uninsured and underinsured residents. All residents are eligible for this program as it provides up to 75 percent in savings on some medications. Simply follow the link and print your free coupon now to start saving on your prescription drugs. Welvista provides those who are uninsured and unable to afford prescription medicine with means to do so at no cost to the individual. The South Carolina ADAP helps ensure that people who live with HIV and AIDS in the state have access to medication. You must be uninsured or under-insured to qualify for the program. Partners for Healthy Children administers the state extension of the federal Children's Health Insurance Program (CHIP), which helps children in families with too high of incomes to qualify for Medicaid but who have a hard time affording health insurance coverage. Some of the benefits of CHIP include coverage for immunizations and prescriptions. To qualify, a child must typically be age 18 or younger, live in the state of South Carolina and meet income requirements. South Dakota residents have access to a Prescription Assistance Program in which residents can print free discount prescription coupons up to 75 percent in savings at more than 68,000 pharmacies. Simply follow the link and print your free coupon now to start saving on your prescription drugs. The federal Children's Health Insurance Program (CHIP) helps children in families with too high of incomes to qualify for Medicaid but who have a hard time affording health insurance coverage. Some of the benefits of CHIP include coverage for immunizations and prescriptions. To qualify, a child must typically be age 18 or younger, live in the state of South Dakota and meet income requirements. CoverRx is a prescription drug program intended to provide assistance to individuals who are uninsured and are unable to pay for prescription drugs. CoverRx focuses primarily on generic medications, and some name brand insulin and mental health drugs. This program provides Tennessee residents access to a free statewide Prescription Assistance Program (PAP) for uninsured and underinsured residents. All residents are eligible for this program as it provides up to 75 percent in savings on some medications. Simply follow the link and print your free coupon now to start saving on your prescription drugs. The Tennessee ADAP helps people living with HIV and AIDS have access to the medication they need if they are uninsured or under-insured. CoverKids is the state extension of the federal Children's Health Insurance Program (CHIP), which helps children in families with too high of incomes to qualify for Medicaid but who have a hard time affording health insurance coverage. Some of the benefits of CoverKids include coverage for immunizations and prescriptions. To qualify, a child must typically be age 18 or younger, live in the state of Tennessee and meet income requirements. The federal Children's Health Insurance Program (CHIP) helps children in families with too high of incomes to qualify for Medicaid but who have a hard time affording health insurance coverage. Some of the benefits of Texas CHIP include coverage for immunizations and prescriptions. To qualify, a child must typically be age 18 or younger, live in the state of Texas and meet income requirements. Utah residents have access to a Prescription Assistance Program in which residents can print free discount prescription coupons up to 75 percent in savings at more than 68,000 pharmacies. Simply follow the link and print your free coupon now to start saving on your prescription drugs. The ADAP helps individuals living with AIDS and HIV get the medication they need if they are uninsured or underinsured. The federal Children's Health Insurance Program (CHIP) helps children in families with too high of incomes to qualify for Medicaid but who have a hard time affording health insurance coverage. Some of the benefits of Utah CHIP include coverage for immunizations and prescriptions. To qualify, a child must typically be age 18 or younger, live in the state of Utah and meet income requirements. Vermont residents can print free discount prescription coupons up to 75 percent in savings at more than 68,000 pharmacies. Simply follow the link and print your free coupon now to start saving on your prescription drugs. Adjusted gross income below 500 percent of the federal poverty level. These are two similar programs that offer Vermont residents assistance with their prescription medication costs. VPharm makes it easier to pay for prescriptions by offering affordable monthly premiums, while Healthy Vermonters offers prescriptions. Dr. Dynasaur is the Vermont extension of the federal Children's Health Insurance Program (CHIP), which helps children in families with too high of incomes to qualify for Medicaid but who have a hard time affording health insurance coverage. Some of the benefits of Dr. Dynasaur include coverage for immunizations and prescriptions. To qualify, a child must typically be age 18 or younger, live in the state of Vermont and meet income requirements. This free statewide program is available to all Virginia residents. Simply go to the website and print your prescription coupon card to begin saving up to 75 percent on prescription medications. The AIDS Drug Assistance Program (ADAP) helps low-income members pay for HIV-related medications, copayments and insurance premiums. Funded by federal grants, ADAP offers four options. FAMIS is the Virginia extension of the federal Children's Health Insurance Program (CHIP), which helps children in families with too high of incomes to qualify for Medicaid but who have a hard time affording health insurance coverage. Some of the benefits of FAMIS include coverage for immunizations and prescriptions. To qualify, a child must typically be age 18 or younger, live in the state of Virginia and meet income requirements. WSHIP works as a secondary insurance to help pay out-of-pocket costs. The federal Children's Health Insurance Program (CHIP) helps children in families with too high of incomes to qualify for Medicaid but who have a hard time affording health insurance coverage. Some of the benefits of Washington CHIP include coverage for immunizations and prescriptions. To qualify, a child must typically be age 18 or younger, live in the state of Washington and meet income requirements. West Virginia residents can print free discount prescription coupons up to 75 percent in savings at more than 68,000 pharmacies. Simply follow the link and print your free coupon now to start saving on your prescription drugs. The federal Children's Health Insurance Program (CHIP) helps children in families with too high of incomes to qualify for Medicaid but who have a hard time affording health insurance coverage. Some of the benefits of West Virginia CHIP include coverage for immunizations and prescriptions. To qualify, a child must typically be age 18 or younger, live in the state of West Virginia and meet income requirements. This program offers prescription drug assistance for a $30 annual fee. Your coverage is determined by your income. The WCDP is a state-funded organization that helps members pay for services and supplies that Medicare doesn’t cover. The program is made up of three smaller programs, each focusing on a chronic condition. Those conditions are chronic renal disease, hemophilia and adult cystic fibrosis. Each condition-specific program has its own benefits and requirements. Members of this program are able to get blood derivatives and supplies for home infusion with just a $10 copay per product. The Wisconsin ADAP helps people living with HIV and AIDS have access to the medication they need if they are uninsured or under-insured. BadgerCare Plus administers Wisconsin's extension of the federal Children's Health Insurance Program (CHIP), which helps children in families with too high of incomes to qualify for Medicaid but who have a hard time affording health insurance coverage. Some of the benefits of BadgerCare Plus include coverage for immunizations and prescriptions. To qualify, a child must typically be age 18 or younger, live in the state of Wisconsin and meet income requirements. Wyoming residents have access to a Prescription Assistance Program in which residents can print free discount prescription coupons up to 75 percent in savings at more than 68,000 pharmacies. Simply follow the link and print your free coupon now to start saving on your prescription drugs. This program provides eligible individuals with three prescriptions per month when they pay $10 for generics and $25 co-pay for name brands. The programs listed above are not Medicare prescription drug plans. Eligibility may vary by program. Discounts are only available at participating pharmacies. Contact your state’s Department of Insurance for more information about programs in your state. Have an annual household income at or below the current income guideline, based upon your county of residence. Kid Care CHIP is Wyoming's extension of the federal Children's Health Insurance Program (CHIP), which helps children in families with too high of incomes to qualify for Medicaid but who have a hard time affording health insurance coverage. Some of the benefits of Kid Care CHIP include coverage for immunizations and prescriptions. To qualify, a child must typically be age 18 or younger, live in the state of Wyoming and meet income requirements.